Gold continues to tumble today after a brutal Friday session took the shiny yellow metal below $1600 per ounce. Over the past four months, it’s fallen more than 10 per cent from its October 4 high of $1798.10. In a note to clients, Deutsche Bank commodities analyst Xiao Fu has a few thoughts on why gold prices are falling. 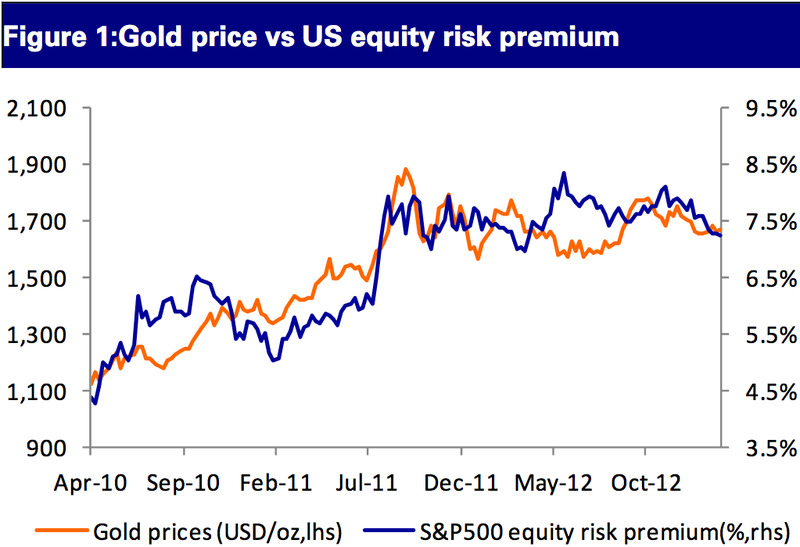 Perhaps the biggest factor weighing on gold prices is the drop in the equity risk premium, which in turn is driven by rising yields. The equity risk premium is the expected rate of return of stocks over that of bonds (here, specifically, it’s defined as the S&P 500 earnings yield less the yield on a 10-year Treasury bond). The chart below shows that gold prices track the ERP pretty closely. As bond yields rise – and stocks rise, depressing the S&P 500 earnings yield – it’s caused the ERP to fall. The recent rise in bond yields has been encouraged by the release of the December FOMC minutes in early January, which revealed for the first time that the Federal Reserve was considering reining in quantitative easing by the end of 2013. Wednesday, the Fed will release the minutes from the January FOMC meeting – which followed the release of the December minutes – and observers will get a chance to see how that discussion morphed in January. Gold returns have historically performed well when short- and long-term real interest rates are low or negative. Successive rounds of QE programmes over the past few years have worked to push U.S. 10-year real Treasury yields deeper into the negative territory. More recently, the Fed’s rhetoric regarding potential QE exit has lowered market expectations of future QE and the decline in 10-year real yields has reversed. As the macro outlook improves, ultra-accommodative monetary policy will become harder to justify. Our Economics team expects the Fed to begin unwinding its unconventional policy by ending QE purchases around Q4 this year. This could lead to higher yields and further headwinds for gold prices. Even so, the erratic nature of the recovery in U.S. real economy data indicates that real yields and the gold price will remain sensitive to Fed speak. Consequently the release of the FOMC minutes this Wednesday will provide important guidance on the U.S. monetary stance and thus gold prices in our view. 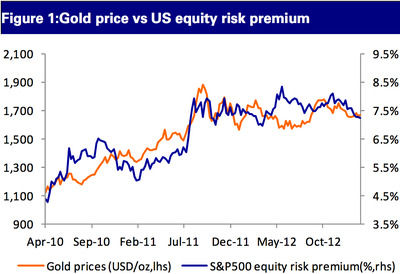 Deutsche Bank expects gold to average $1856 per ounce in 2013.